Securely provide a storage container for uploading a file. Use the Python client to upload a file through your IoT hub. The Send telemetry to IoT Hub quickstart demonstrates the basic device-to-cloud messaging functionality of IoT Hub. However, in some scenarios you cannot easily map the data your devices send into the relatively small device-to-cloud messages that IoT Hub accepts. When you need to upland files from a device, you can still use the security and reliability of IoT Hub. IoT Hub Python SDK currently only supports uploading character-based files such as .txt files. FileUpload.py, which uploads a file to storage using the Python Device SDK. Python 2.x or 3.x. Make sure to use the 32-bit or 64-bit installation as required by your setup. When prompted during the installation, make sure to add Python to your platform-specific environment variable. If you are using Python 2.x, you may need to install or upgrade pip, the Python package management system. An active Azure account. If you don't have an account, you can create a free account in just a couple of minutes. 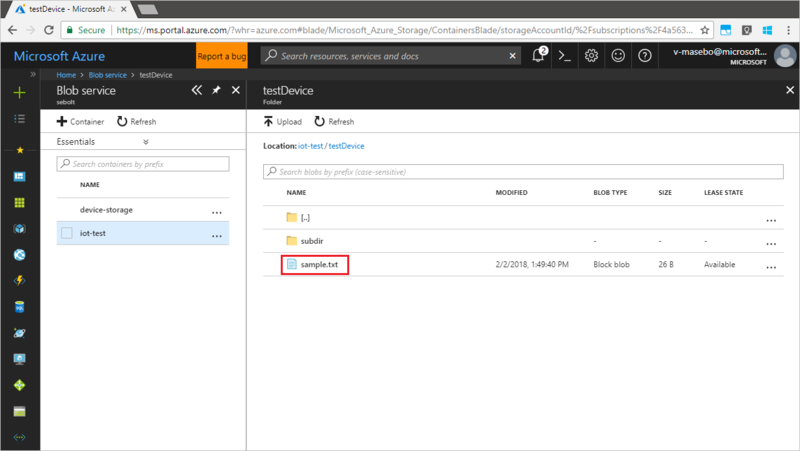 An IoT hub in your Azure account, with a device identity for testing the file upload feature. 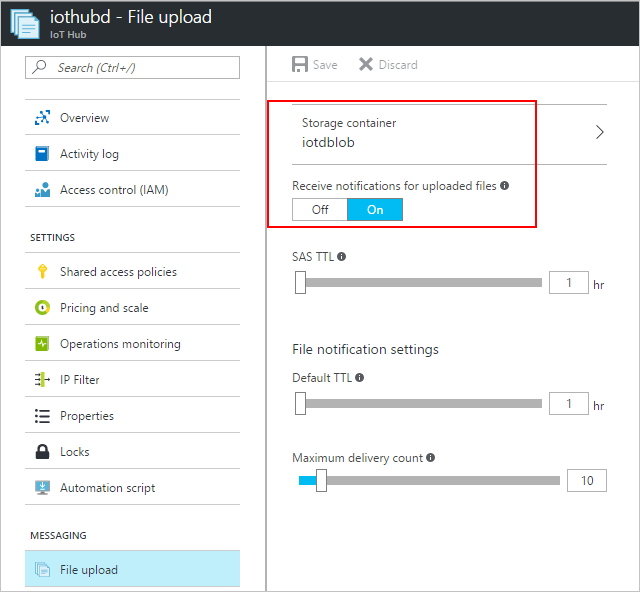 Because the simulated device app uploads a file to a blob, you must have an Azure Storage account associated with your IoT hub. When you associate an Azure Storage account with an IoT hub, the IoT hub generates a SAS URI. A device can use this SAS URI to securely upload a file to a blob container. The IoT Hub service and the device SDKs coordinate the process that generates the SAS URI and makes it available to a device to use to upload a file. Follow the instructions in Configure file uploads using the Azure portal. Make sure that a blob container is associated with your IoT hub and that file notifications are enabled. In this section, you create the device app to upload a file to IoT hub. Using a text editor, create a test file that you will upload to blob storage. Using a text editor, create a FileUpload.py file in your working folder. Add the following import statements and variables at the start of the FileUpload.py file. CONNECTION_STRING = "[Device Connection String]"
PATHTOFILE = "[Full path to file]"
FILENAME = "[File name for storage]"
In your file, replace [Device Connection String] with the connection string of your IoT hub device. Replace [Full path to file] with the path to the test file that you created, or any file on your device that you want to upload. Replace [File name for storage] with the name that you want to give to your file after it's uploaded to blob storage. Save and close the UploadFile.py file. Now you are ready to run the application.